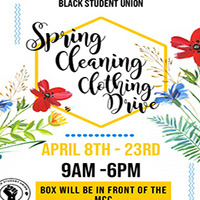 The Black Student Union asks you to donate any old clothes, shoes, books, etc. during our Spring Cleaning Drive! Just drop your items off in front of the Multicultural Center from 9 a.m. until 6 p.m. April 8-23, and we will donate them to the Potters Wheel of Evansville.